Directions – Providence Computers – "The advice you need, from the guys you know." 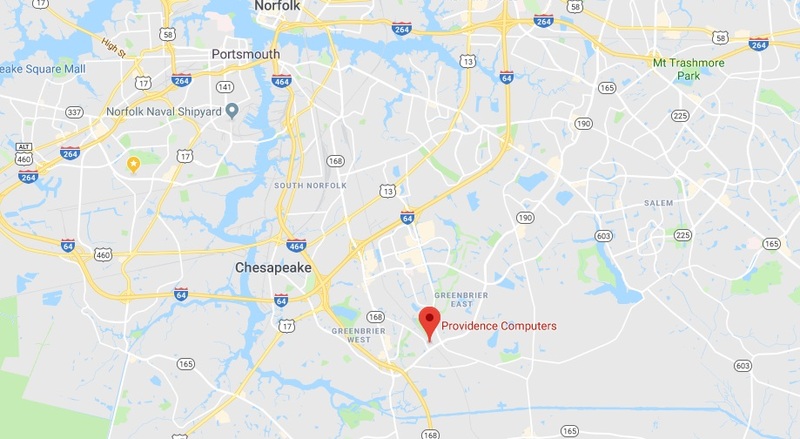 We are located near the corner of Kempsville and Greentree behind Wawa next to Walmart. Take a right on Centerville Turnpike after the CBN Center. Take a right on Kempsville Road by the Walgreens. Look for us on the right hand side just after the rail road tracks behind Wawa next to Walmart. Take Kempsville Road north to Greentree Road, take a left and then your first right into the shopping center. Take Greenbrier to Kempsville Road. Take a right on Kempsville Road towards the rail road tracks. Take 64 and Exit 289B to Greenbrier Pkwy. Take Greenbriar to Kempsville Road.